Footballers Mamayev and Kokorin to remain detained in hooliganism case | Russian Legal Information Agency (RAPSI). 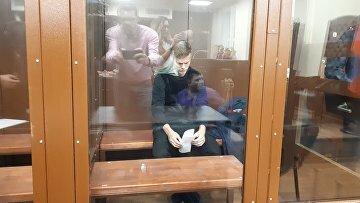 MOSCOW, October 19 (RAPSI) – The Moscow City Court on Friday upheld detention for Zenit St. Petersburg’s football player Alexander Kokorin and Krasnodar’s Pavel Mamayev charged with hooliganism and battery, RAPSI reported from the courtroom. An appeal against detention of Kokorin’s brother Kirill was also dismissed. The three defendants will stay jailed until December 8. The Tverskoy District Court of Moscow ordered detention for Mamayev, Kokorin, his brother Kirill and coach Alexander Protasovitsky last week. 13:59 19/10/2018 The Moscow City Court on Friday upheld detention for Zenit St. Petersburg’s football player Alexander Kokorin and Krasnodar’s Pavel Mamayev charged with hooliganism and battery.